More than once, I’ve published an essay on how I’m not a man with a disability waiting for a cure, that I’m grateful for the life that I’ve been given, and I wouldn’t ask for a different life path. I was born with cerebral palsy, I live with cerebral palsy, and I’ll die with cerebral palsy – and I’m grateful for the life encompassed within, as-is. I’ve also written about how I don’t believe that it’s healthy for anyone to put his or her life on hold awaiting a cure – life is what we have in front of us at any given moment, so let us make the most of it. Nevertheless, despite my own self-acceptance and encouraging all to live life to the fullest as-is, I’ve increasingly supported cure-based causes, not toward any specific condition, but toward the betterment of the human condition overall, where if we can treat and prevent a range of disabilities moving forward, we’re evolving humanity – and changing individual lives – in very meaningful ways. Spinal cord injury research toward a cure is a great example of one cause among many that I support, where I recently spoke at the national Unite 2 Fight Paralysis Science and Advocacy Symposium in Phoenix. 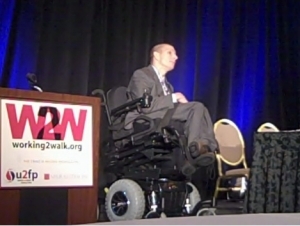 Now, you may be wondering, why I, as one with cerebral palsy, who’s not looking to cure myself, spoke at a cure-based conference geared toward paralysis? My appearance actually made perfect sense to me and the 150 people in the audience. See, the foremost area of research toward treating and curing spinal cord injuries is stem cells – and stem cell research potentially effects every person on the globe, likely treating and curing more than 80 illnesses, diseases, and disabilities. And, what’s amazing is that we’re already seeing results, where children’s own umbilical cord blood stem cells have been used in recent years to treat their illnesses and disabilities – including cerebral palsy. In fact, my sister, a cancer survivor, had her daughter’s “cord blood” banked, so that in the event that my sister has a recurrence of cancer, she has cord blood stem cells to dramatically aid in her treatment (and the same cord blood can likewise serve her daughter or husband toward illness and disability, if ever needed). Therefore, my talk wasn’t about curing any one condition, but about uniting our voices in support of research toward enhancing the human condition through research-driven cures as a whole. Interestingly, my position of seeing tremendous humanitarian value in curing as many conditions as possible places me at philosophical odds with a radical fringe of the disability community – that is, a select few who believe that cure-based efforts do nothing but harm those living with disability by suggesting that we’re damaged goods, needing to be fixed, that we need to forget about cures and emphasize disability as a “natural part of human diversity.” However, here’s the problem with such fringe thinking: It contradicts science at best, and is inhumane at worst. If we look at the origins of “disability” in an evolutionary context, it’s classified as three primary causations: A genetic or developmental anomaly; an injury; or, a disease or illness. To presume all of those as a “natural part of human diversity,” is scientifically invalid. We know that, barring modern medical intervention, genetic or developmental “variants” that are detrimental to survival weed themselves out, so they become extinct. We know that “injuries” are an anomaly that are totally avoidable beyond the given circumstance that caused injury – as in, there’s nothing “natural” about getting paralyzed in a car accident. And, we know that many diseases are preventable based on human behavior, diet, and environment. In these ways, it becomes impossible to argue that “disability,” as a scientific absolute, is a “natural part of human diversity.” Scientifically speaking, forms of cerebral palsy, paralysis, and HIV simply don’t occur unavoidably by nature in each of us – they result from extraneous factors – and many genetic variations would become extinct if modern medicine wasn’t able to preserve so many lives at birth. In this way, stating that we should “simply accept disability as a part of nature” truly goes against what we know from science, that very few disabilities are literally a “natural part of human diversity,” but occur via other causations – ones that are increasingly preventable and treatable. Using paralysis as a perfect example, we’ve used research in the automotive field – occupant restraints, headrests, and so on – to reduce injuries, and it only makes sense to use research in areas like stem cell therapy to treat any injuries. A cure for paralysis, therefore, isn’t altering a “natural part of human diversity”; rather, it’s using science to resolve an injury, restoring one’s full abilities. Secondly, the belief that the quest for cures somehow detracts from those of us living with disabilities is a specious argument. Do some able-bodied individuals think that we live lesser lives without a cure? Of course they believe such. Do some individuals with disabilities feel that they, themselves, live lesser lives without a cure? Of course they believe such. However, they’re not emblematic of most of us, where we’re intellectually balanced enough to see both exceptional quality of life in living with disability while simultaneously supporting the quest for cures. Yet, the disability radicals will tell us that we can’t have acceptance and dignity while also supporting cure-based efforts. And, the radicals’ bitter, illogical perspective couldn’t be more distorted or inhumane. I think back to my daughter’s birth, where due to my wife’s genetic condition, my daughter had a 50-percent chance of being born with a severe disability, where brain surgery would be needed to stop the progression of the condition for her to live. I had cerebral palsy, and my wife had genetic generalized dystonia, so we both knew how well we were living with disability, that we didn’t doubt our daughter could do just as well despite the projected health issues. We knew the risks and we were willing to love and raise our daughter, disability or not. However, as parents, of course we hoped that our daughter didn’t have the genetic condition. After all, given the choice, what rational parent wants his or her child living with disability? Although our daughter was born without the genetic condition, we were prepared to love her either way, but we were likewise relieved that she was born without disability. The question is, then, because I was relieved that my daughter wasn’t born with a disability, was I diminishing my own self-worth as one with a disability, did my mindset suggest that I didn’t want my daughter to be a lesser person like me, as the fringe’s thinking suggests? Of course not. I was simply a father wanting the absolute best for my daughter – it’s how fatherly love works. Again, no rational parent would choose disability for his or her child, just as no rational person would wish unbridled disability as a fixture of human existence when we have potentials for prevention and cures. From this perspective, we have to wonder why, by default, do those opposed to cure-based efforts seemingly want others to endure unbridled illness, disease, and disability, and suggest that if you support the quest for cures, you’re truly devaluing disability experience? Why do they stick to their position of, Disability is natural, and by seeking cures, we’re not accepting disability as valid way to live – we need acceptance of disability, not cures? What they’re missing is a balance in their disability experience. They’re so wrapped up in themselves that they have no ability to consider the lives of others. Again, I can be totally accepting of my own disability while wanting absolute function and health for everyone else – it’s called having empathy and compassion. In very simple terms, I can’t walk, and I’m fine with that; but, I want everyone else to walk because it makes their lives easier on a fundamental level. What the radicals don’t understand is that you can have a disability and compassion toward others at once, where you can be completely comfortable in your skin, but still not wish hardships on others. And, most importantly, you can be totally accepting of disability while simultaneously striving to help others avoid its challenges through cure-based efforts. See, I support the quest for cures not because of the promise that they show toward me, but because of the promise that they show toward all of humanity. The cure, no cure debate that rages on within the disabled community to me boils down to a few simple issues. The first is timing. Many with life long disabilities, like myself say that by taking a cure I’d be denying the amazing life journey that has helped define who I am today. I suspect that many who make the same claim aren’t really as comfortable in their own skin as they boast and they use anti-cure rhetoric to mask their true emotional comfort behind their anti-cure stance. Many within the disabled community, myself included say that if a cure were to magically appear for their condition they wouldn’t take it. In reality I’m not sure that this is the whole story. You see I believe that much of the cure debate amongst the disabled really comes down to an issue of timing. I believe that the answer to the question of taking the cure or not changes dramatically if you state that the cure was available at the time the disabling condition is acquired. While I’m not interested in some sort of transformative cure I have to admit that if a cure had been available to my parents when I was born I indeed would hope they would have chosen it for me. In the same way I am certain that the spinal cord cure debate would be moot if it were already a part of established medical practice. For many conditions we aren’t going to find cures overnight and the cures we do find may take many incremental steps along the way to perfect. I believe it is equally important to support those living with disabling conditions as it is to continue the research that leads to cures. The generations of folks who have lived their lives before a cure must be respected as much as the generations that comes after a cure for their condition is found. The other big issue around cure based efforts that seems to be lost on the radical disabled population is that treatment that slows or arrests the progression of many disabling conditions often come before full on cures and is the result the same fundamental research efforts funded by cure based organizations. While I’ve stated that I have no interest in a cure for myself, the natural progression of my genetic disorder makes me wish somedays that there were an effective treatment that assured I could live out the rest of my days with the function I currently have. Additionally there is is nothing to say that as a person with a disability there isn’t a further disabling condition in my future, a condition that I would want treatment for. Therefore I feel that to take a stand against cure based efforts would make me a hypocrite against not only my own true feelings but also against my spiritual belief in living a compassionate life. Fundamentally we all deserve the right to choose our own life path and until there is a cure there is no real choice for many. Thanks again for another balanced article. I wonder if these “radicals” are also against seeking cures for cancer, heart disease and diabetes etc as well? It is the same rationale, it is a “natural” event, so a cure should not be sought? I have worked with people with a range of limitations/diseases/disabilities over my life as an occupational therapist, and truly, attitude is the biggest “limitation”. Thank you for this truly lovely analysis regarding a cure. I know exactly how you feel. When I was first paralyzed and knew almost nothing about the fight for a cure, I just thought, “Oh well, better get on with living,” and I did. Then after reading more and more about the work going on to cure spinal cord injury, I realized how possible a cure actually was. Now trying to organize to win a cure, and this is also part of my getting on with living. I don’t see how people could even think that fighting for a cure somehow diminishes me as a human being who is a paraplegic. Anyhow, I just wanted to say thanks.